The post Barcelona GP test was of course the backdrop to Mercedes trial of the 'Megaphone' exhaust but the day before Nico donned the ludicrous exhaust appendage, Lewis tried out a new Y100 Winglet / Monkey Seat for the team. The image in the upper left depicts the Y100 winglet that the team have been using since the start of the season. It's clear to see there are some subtle but widesweeping changes made for the one that the team tested. The lower section of the endplates have been swept inward in an attempt to invoke the airflow in that region to be upwashed. 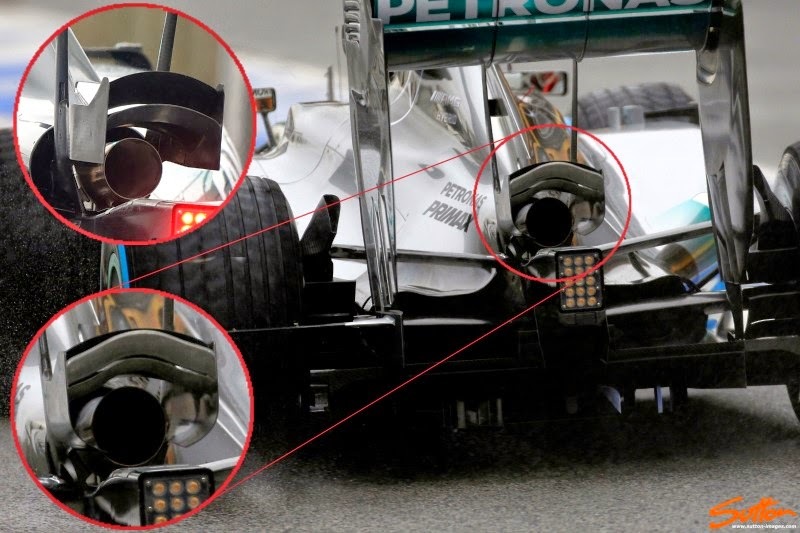 Much like the other teams who've converged on the idea originally used by McLaren to use an exhaust surround like an aspirator, pulling the airflow both through and over the surrounding bodywork Mercedes are now looking to do much the same. In order not to drastically alter what has already been used they've opted for this more adaptive solution. The inner curved horizontal winglets have been both shaped differently, raised to sit just under the upper winglets and covered in thermal paint (Zircotec). This is needed as you'll note that the whole winglet has been lowered at guesstimate of 20mm toward the exhaust, which also seems to have been increased slightly in diameter. All in all the changes are a clear signal that the team are still investing time and effort in utilising and conditioning the airflow around the exhaust in an effort to extract performance, albeit with the exhaust plume generating less energy than its V8 counterpart.